So, with the the release of my paper organising program 'Making Your Paper Work' today I'm sharing a list of the 17 greatest tools for paperwork organisation, so you can reduce the stress, worry and frustration around this task. Let's dive in! A paper inbox is an essential part of any great paper organising routine. Take 5 minutes each day to quickly sort the incoming paperwork that you need to take action on. Then designate one day of the week as your 'Paper Admin appointment' where you can tackle all the action tasks in one sitting. The simple act of sorting papers within your Inbox will take a lot of the headache out of dealing with paper-related tasks! Teamed with your Paper Inbox, file folders are a handy way to sort your actionable paperwork into specific categories e.g. to pay, to file, to fill out, to send etc. You could even have a separate file folder for each family member, and any task that relates to them can get popped in to the file to be dealt with on your Paper Admin day. Lacking surface space for sorting your paperwork? Have a look around your house for free vertical wall space to attach some simple mesh baskets or slimline boxes. Pop a label on the front and use this system for your Paper Inbox. Aim to clear these every week so you don't accumulate too much visual clutter! Magazine holders are a great way to sort and hold paper in your home office, or command centre. You could use these to store magazines or articles you need to refer to later; a household or finance binder; paper for printing... The great thing about magazine holders is you can hide away those more unsightly paper categories, and make everything look neat and streamlined on open shelves. If you're serious about getting rid of as much paper in your home as possible, a shredder will be a great help! Any documents that have your personal information on them should be shredded before you place it in the recycling, so a shredder can be a worthwhile investment. Hide it away in a basket if it's a bit too 'functional-looking' for your liking, or get a more slimline desktop version. If you're ready to create a paperless home, you'll need a scanner to digitize your files and create a digital filing system. The Fujitsu ScanSnap comes highly recommended, as it scans fast, has WiFi connection, and a large capacity. An easy reference binder contains all the important information you need to refer to regularly in an easy-to-access spot. A household binder can be used to store account and policy numbers; contact details of the companies you're with; medical records; household information; and your child's important school information. A finance binder is a great way to track your bills, debts and savings in an organised approach. Binders can be used in any way you like to organise all your important info in one easy-to-use system. Baskets are a stylish yet practical way to organise those loose paper categories that you need to corral in one centralized spot. 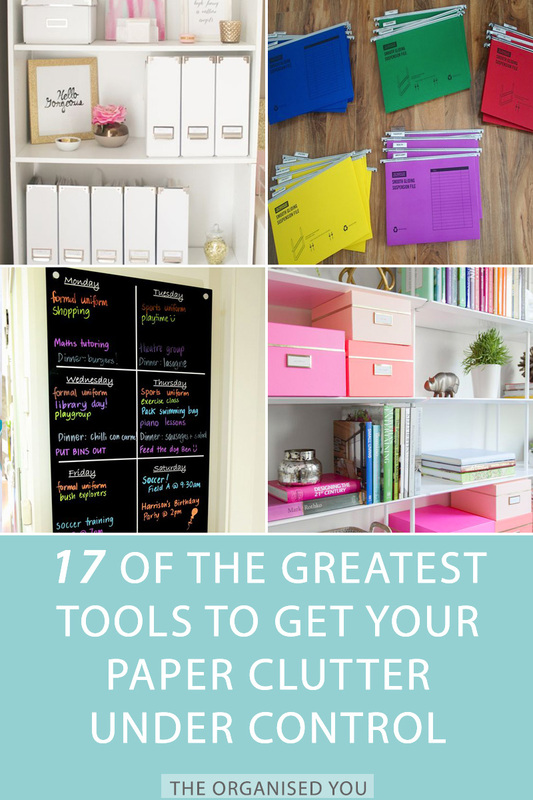 This could include notepads, notepaper, sticky-notes, scrap paper, blank labels etc. Be wary of stacking too many baskets on top of one another, as it will make the items less accessible. Either use open baskets, or only store things you don't need frequent access to in stacked, lidded baskets. Labels are integral for making any paper organisation system easy to follow. This includes binders, file folders, your filing system, baskets, boxes, magazine holders... Make it as easy on yourself as possible with a clear label or colour-coded system! Whether it's cork, chalkboard, dry-erase, magnetic metal, mesh... a memo board is essential for keeping track of upcoming events, important reminders, and your weekly planning. Whether you prefer paper or digital, a calendar is a must for keeping track of your schedule and upcoming events. One with separated columns for each family member makes it easy to can see at a glance what's coming up for each person on different days. If the members of your family are here, there and everywhere throughout the week, or you're always having to remind your kids what's happening and when, a family scheduler could save you a lot of stress and effort! A nice big colour-coded one that's easy for everyone to see makes keeping on track of your 'busy-ness' a breeze. Unless you're creating a digital filing system, a filing cabinet or drawer is the best way to store and organise your archival papers. Not sure what to hold onto and for how long? This episode of The Organised You TV will give you a starting point and some ideas of what you can safely purge. Team your filing system with multi-coloured files to create a clear distinction between the various filing categories i.e. work, banking, household, important records etc. Read more about this system here. These large tubs are a fantastic storage solution for your child's school memories and special artwork. You can also use a transportable tub like this for a filing system, so they really are multi-purpose! This video will show you the 5 simple steps for setting up a School Memory Box - it's actually a fairly fun and easy process! Not only can they look stylish in a home office or command centre, paper boxes are a great way to hide away any loose papers that you don't need to access regularly. In our household, we use Ikea paper boxes as memory boxes for each family member, and to hold photos and cards. 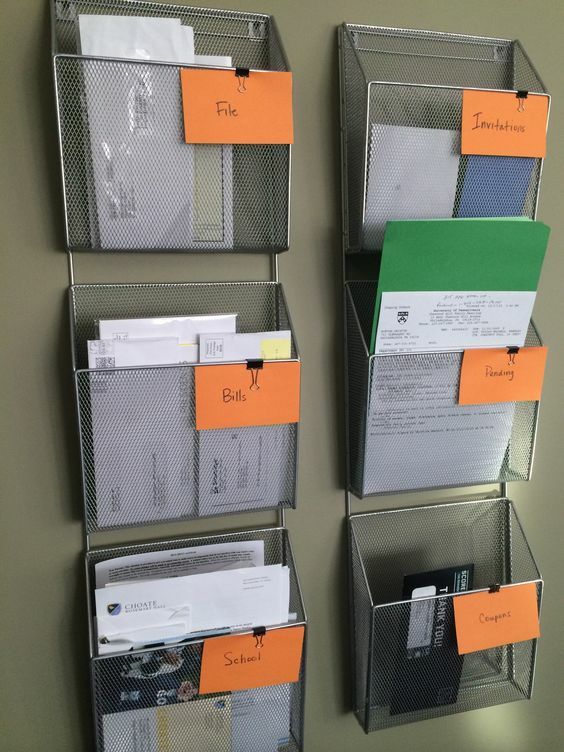 If you're a coupon-collector, or like to follow an envelope system for budgeting, a wallet divider is a great tool! With clear categorized labels, and the ability to easily slot inside your wallet or purse, it's a simple system for corralling all the loose papers or receipts. UPDATE: My new program 'Making Your Paper Work' is designed to help you sort through that pesky paperwork once and for all! I’ll walk you through the steps for creating great paperwork systems for your household and your family so you can feel more in control of the paperwork, rather than letting it control you.